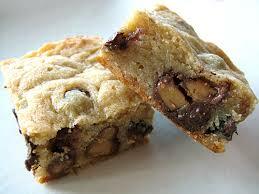 Moist and delicious blondies loaded with chocolate chips and crunchy walnuts. Here is an easy dessert recipe for Walnut Blondies. Grease a 9-inch square baking pan with non-stick cooking spray, coat the pan evenly with flour, removing any excess. Cream the butter and sugars together until smooth. Mix in the egg and the vanilla extract. Add the flour, baking powder, and salt and stir until everything is evenly blended. Fold in the walnuts and chocolate chips. Dump the batter out into the prepared pan and spread it out evenly with a spatula. Alternatively, place a piece of plastic wrap on top of the dough and press it evenly into the pan. Bake for 25 minutes or until a toothpick inserted into the center of the batter comes out clean. The top should be golden brown. Let the blondies cool to room temperature before cutting into 16 (2-inch) squares.